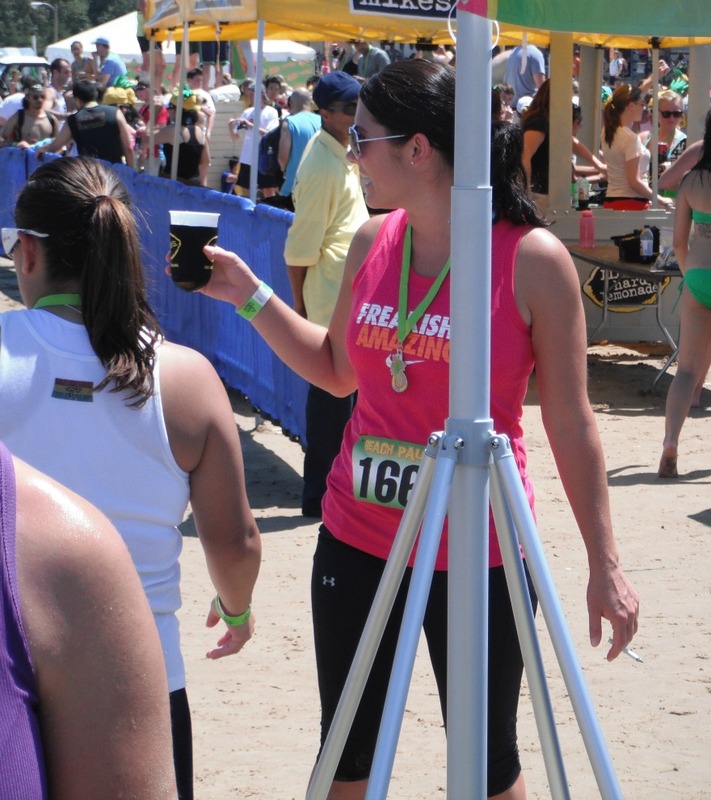 What do you do after you cross the finish line of a race? There's post-race drinking. Post-race get-me-back-home-as-soon-as-possible. Post-race clothing change. Post-race massage. Post-race refueling--my personal fave, especially after a marathon. But I spotted a new--and unfortunately quite disgusting in my opinion--one over the weekend: post-race smoking. Seriously? You just ran 3.1 miles, hopped over and through obstacles, trudged through the sand and an arctic pool now turned lukewarm from the heat, and crossed the finish line at the hot-as-Hades Chicago Beach Palooza, and you're going to light a cig? What could be more awful tasting--and worse for the lungs already recovering from the "trauma" of a hot and heated run--than taking a drag? I don't get it. Maybe it's because I'm not a smoker. 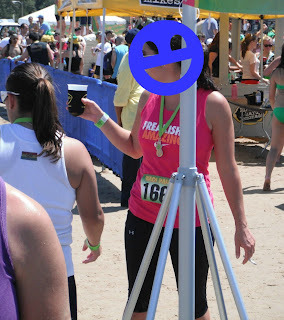 Or maybe it's because my out-of-running-shape body could barely handle the cross-country 5K--and hoisting myself up and over some of those obstacles--in the heat. 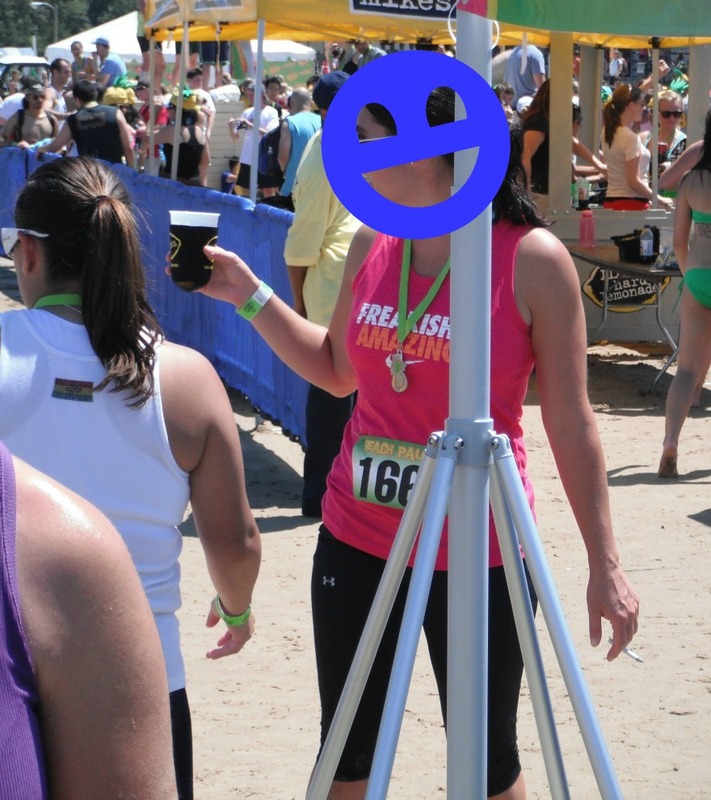 Maybe it's because I was huffing and puffing at the finish line and all I wanted was to gulp all the water I could grab from the volunteer. Or maybe it's because she really wanted to live up to that "freakishly amazing" title on her tank top. Yeah, running with lungs full of tar would be freakish, but maybe not so amazing--or awesome. Note: I'm only slowly easing back into running but I'm digging these 5Ks where I tote my camera. If I can't run fast or as well as I'd like, at least I can capture some pretty random memories (like this one). I do not get this at all. Aren't we, as athletes who train for events, supposed to be concerned with health and fitness? What is "healthy" or "fit" about smoking? *sigh* Then again, playing the devil's advocate, I suppose the same could be said about serving beer at the finish line. Though, in my mind, there is some distinction (I don't know why). But, from a physiological point of view, I don't know how they don't cough up a lung during the event or after, when they take that first drag. GROSS. Glad I'm not the only one. You're so right on bringing up the beer point, but I'd agree that there is something different about it. Someone could argue that a smoke could "taste" good after a run, but I'm still under the impression that a beer, or the Mike's Hard Lemonade being served at this event, tasted a lot better. I dunno, I'd still trade these effects (http://runningtimes.com/Article.aspx?ArticleID=3950) over coughing up a lung.